I am not culturally nor religiously Jewish (surprise! ), but have adopted some Jewish practices into my life. Namely, I observe a weekly Sabbath. The Sabbath is meant to be a day of rest; a time to pause on all things work-related, and make space to be restored and refreshed. I have been practicing the Sabbath for over five years now, and am completely convinced that I am a better person because of it. In Jewish tradition, there are many guidelines about what to do and not do on the Sabbath. 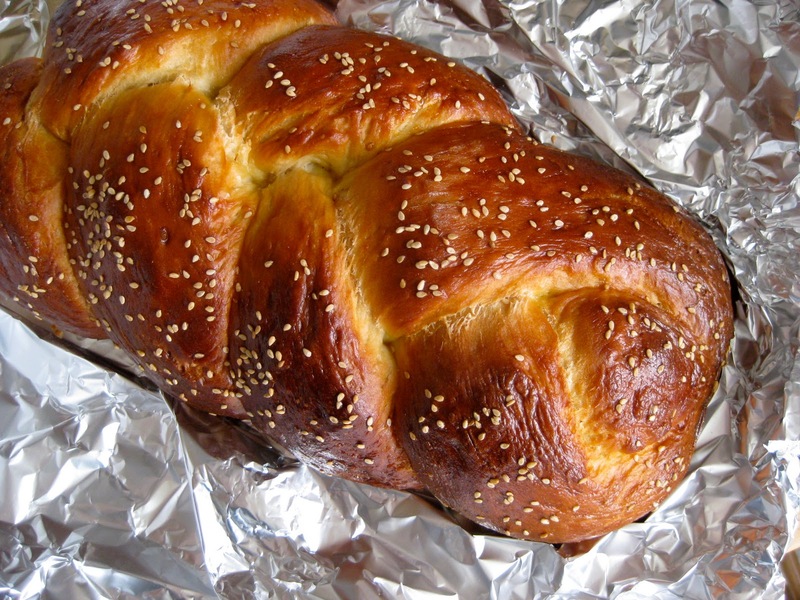 One Sabbath ritual is the baking of challah, a special braided egg bread. Among other things, challah is meant to symbolize God’s generous provision. On one recent Sabbath, I made my own challah. The zen-like act of kneading and allowing the dough to rise seemed like an appropriate act on my day of rest. The bread itself was delicious, with just a hint of sweetness. The recipe made two large loaves, which was more than enough for my husband and me. I used some of the leftover bread to make some baked blueberry French toast. But that’s a recipe to share another day. In a large bowl, sprinkle yeast over barely warm water. Beat in honey, oil, 2 eggs, and salt. Add the flour one cup at a time, beating after each addition, graduating to kneading with hands as dough thickens. Knead until smooth and elastic and no longer sticky, adding flour as needed. Cover with a damp clean cloth and let rise for 1 1/2 hours or until dough has doubled in bulk. Punch down the risen dough and turn out onto floured board. Divide in half and knead each half for five minutes or so, adding flour as needed to keep from getting sticky. Divide each half into thirds and roll into long snake about 1 1/2 inches in diameter. Pinch the ends of the three snakes together firmly and braid from middle. Either leave as braid or form into a round braided loaf by bringing ends together, curving braid into a circle, pinch ends together. Grease two baking trays and place finished braid or round on each. Cover with towel and let rise about one hour. Preheat oven to 375 degrees. Beat the remaining egg and brush a generous amount over each braid. Sprinkle with sesame seeds if desired. Bake about 40 minutes. Bread should have a nice hollow sound when thumped on the bottom. Cool on a rack for at least one hour before slicing.